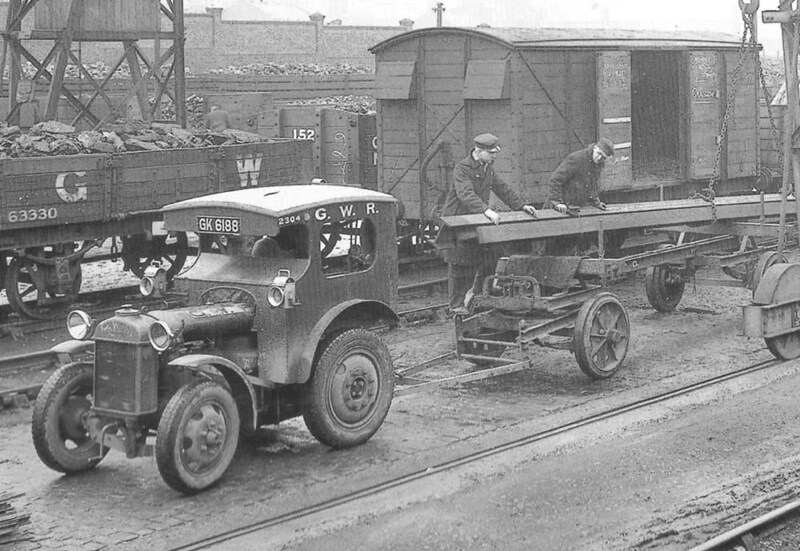 Close up of image 'gwrqhy2642' showing the mechanical tractor No 2304 and a trailer being loaded with steel joists in February 1933. This is a Fordson Model F or Model N tractor modified from the standard agricultural model by the provision of pneumatic tyres, mudguards, electric lights and a cab (entry was from the rear). These tractor units had an inline four cylinder side valve petrol engine which produced 20hp (15kW) at 1,000 rpm. It had a three speed constant mesh transmission with one reverse gear. Note the crank starting handle below the radiator at the front. The early Fordson tractors had solid rubber tyres and no cab, but two of those purchased in 1927 were given special sprung wheels by Muir-Hill Service Equipment Ltd of Trafford Park, Manchester (see gwrw2025). Later road legislation restricted the speed of vehicles with solid tyres due to the damage the wheels caused to the roads and pneumatic tyres became standard. In 1930, the Great Western Railway authorised the purchase of a further 22 tractors (including twenty Fordson tractors) and more were ordered in 1932. Tractor No 2304 has registration number plate GX 6188 making it likely that this was part of this 1932 order, as the prefix letters indicates a London allocation between March and June 1932.